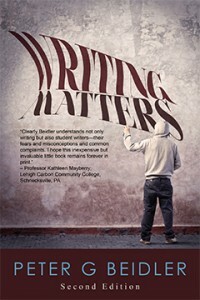 For several years, Peter G. Beidler’s Writing Matters has been a popular textbook for high school and college students. In the revised second edition of Writing Matters ($13.95, 230 pages, 6×9 Trade Paperback ISBN: 978-1-60381-174-3), Beidler improves on the first by presenting an expanded section on editing. Many students dread writing essays because no one has bothered to break down the process in a clear, down-to-earth fashion. Writing Matters is the remedy. Beidler offers both good and bad examples, explaining why the writers succeeded or why they went astray. Although originally written for first-year university students learning composition, Writing Matters has also been invaluable to ESL students and those in high school preparing for the SATs. PETER G. BEIDLER has recently retired from the English department at Lehigh University. He has published widely and has won many teaching awards. He was named National Professor of the Year by CASE—Council for the Advancement and Support of Education.